Users licensed for the data service can access our China gas balances and gas imports data. China’s natural gas imports reached another record high, of 9.2 Mt in December 2018, rising y/y by 1.34 Mt (17%), though this was the lowest growth rate since April 2017. Overall in 2018, China imported 90.5 Mt, higher y/y by 21.7 Mt (32%), compared to a 14.6 Mt y/y increase in 2017. December 2018 LNG imports surged to a record high of 6.3 Mt (+1.26 Mt y/y) as the majors had bought ample LNG supplies for the winter, bringing 2018 LNG imports to 53.8 Mt, up by an eyewatering 15.6 Mt y/y. Domestic assessed prices averaged around 14 $/mmbtu in December 2018, well below December 2017 levels, and the majors are even starting to resell LNG cargoes in January. While HDDs were up by 5% y/y in December, they were still down by 10% on the 10-year average. That relatively mild December 2018 (although it did feature a week of cold weather) and more modest demand helped pipeline imports come in at a reasonably soft 2.9 Mt in December 2018, falling sequentially m/m by 0.22 Mt but staying largely flat y/y. Over all of 2018, natural gas pipeline imports totalled 49.8 bcm or 36.6 Mt (+6.2 Mt y/y, 20%), a step up on the y/y growth of 2.5 Mt (9%) posted for 2017. The growth came from Kazakhstan (+4.7 bcm y/y), Uzbekistan (+3.0 bcm y/y) and Turkmenistan (+1.1 bcm) y/y. The rapid increase in imports into China over 2017 and 2018 and the country’s decision to indefinitely postpone the construction of the fourth line of the Central Asian Gas pipeline (CAGP) suggests that import growth in 2019 will be constrained by infrastructure capacity. The existing three lines on the CAGP have combined nameplate capacity of 55 bcm, and with 2018 imports through it at 47 bcm, growth in pipeline imports from Central Asia by much more than 8 bcm in 2019 will be difficult. Any expansion will depend on whether some of the compressor expansions on feeder pipes to China’s domestic West-East pipeline actually lead to increased import capacity. With 5 bcm of added supply being promised to Kazakhstan, that will have to come from allocation to either Uzbekistan or Turkmenistan. We expect total pipeline imports to China to be up by 6 bcm y/y in 2019, similar to 2018, but this will mean 2020 will have almost no spare import capacity on the CAGP. Our import forecasts for 2019 include no Russian imports, with the 38 bcm/y Power of Siberia pipeline only set to start operation in late December. Even for 2020, we only expect that pipeline to contribute some 5 bcm of imports directly to the North East China gas market, and that will make up the bulk of growth in pipeline imports. Supply was also enhanced by domestic production, which continued to rise in December 2018, reaching 15.3 bcm and bringing 2018 output to 159.4 bcm (+12.3 bcm y/y), compared to a 9.4 bcm y/y uptick in 2017. Although PetroChina’s decision to resume winter operations helped Changqing (+0.2 bcm y/y) and Xinjiang (+0.1 bcm y/y) pump more gas in December 2018, Sichuan was able to deliver the highest growth rate (+0.7 bcm) thanks to booming shale plays in that province. Production from the South China Sea (+0.3 bcm y/y) also recovered, with the start-up of CNOOC’s new gas projects. Gas production saw two very distinct halves to 2018, with H1 18 posting modest growth of 4.0 bcm y/y, followed by a strong 8.2 bcm y/y increase in H2 18, in reaction to President Xi Jinping’s call, in August, to enhance supply security. Some of that growth came from non-conventional sources, with CNPC announcing 4.27 bcm of shale gas production in Sichuan in 2018, up by 40% y/y. Coal bed methane (CBM) production also grew this year, with Shanxi province producing a record 5.7 bcm of CBM in 2018. We expect gas production growth will continue in 2019. 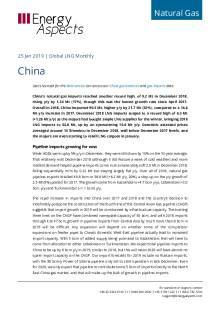 CNPC research expects gas production to grow by around 10 bcm (8.6%) y/y to 170.8 bcm in 2019, which aligns closely with our view. Even though NDRC has yet to publish December 2018 demand data, the Chinese market seems to be adequately supplied so far this winter due to a combination of higher supplies from all sources and a milder-than-expected start to the winter. CNPC research put total gas demand at 277 bcm, higher y/y by 39 bcm (17%), although those numbers suggest that the company has a lower base for 2017 than NDRC data. For 2019, however, CNPC forecasts demand to grow by 31 bcm (11%) y/y, hitting 308 bcm. We are more bullish than those numbers, expecting 38 bcm (13%) of y/y growth. But even at that lower 31 bcm level, demand growth would still be considerable. Demand will remain supported by the government’s commitment to improve air quality and the proliferation of largely independent gas distribution companies, which continue to chase new customers in the urban gas sector. Having said that, any slowdown in China’s industrial production growth will weigh on demand growth, with industry and commercial users being the bedrock for gas demand in China. For the more immediate term, the 14-day forecast starting 25 January shows Chinese HDDs will be down by 36% y/y and by 15% on normal, while the longer-term forecast for February is for largely normal temperatures. If these forecasts materialise, China will have less need to restock, so incremental LNG takes could well come in lower than our forecasts. With demand in 2019 forecast to be up by 31 to 38 bcm y/y, domestic supply up by 10 bcm and pipeline imports up by 6 bcm, there is still a considerable gap to be filled with 16 bcm more (+12 Mtpa) LNG imports. LNG imports over 2018 were consistently strong, facilitated by the majors’ efforts to develop a more flexible receiving and distribution system—including 10 Mtpa of new regas facilities, additional storage tanks, increasing distribution capacity via trucking, and improving interconnectivity on pipelines to allow flows from the south to the north. Reports also suggest that industrial users started installing small LNG storage facilities on site. The strong LNG imports came from Qatar (+0.55 Mt m/m, +0.09 Mt y/y), on the back of a new supply deal signed in September 2018, and Indonesia (+0.26 m/m, +0.34 Mt y/y). Imports from Australia dropped m/m by 0.42 Mt (still higher y/y by 0.29 Mt). In December 2018, electricity output increased to 620 TWh, up y/y by 6.2%, with nuclear power generation rising by 37.9% y/y to 30.6 TWh. Wind and solar power generation reached 33.8 TWh (+20.6% y/y) and 6.2 TWh (+2.2% y/y), respectively. Finally, thermal power output rose by 5% y/y to 477.6 TWh. Across 2018, total power generation increased y/y by 7.4%, reaching 6,720 TWh, compared with 6.5% y/y increase in 2017. Solar and wind power generation remained at high growth rates, with y/y increases of 44% and 18% respectively. Nuclear power generation also continued to increase at a steady pace (+18% y/y). Still, thermal power output grew at 6.9% y/y, up on 2017 numbers (+5.1% y/y), thanks to hydro generation slowing from 3.5% y/y in 2017 to 1.9% y/y in 2018.